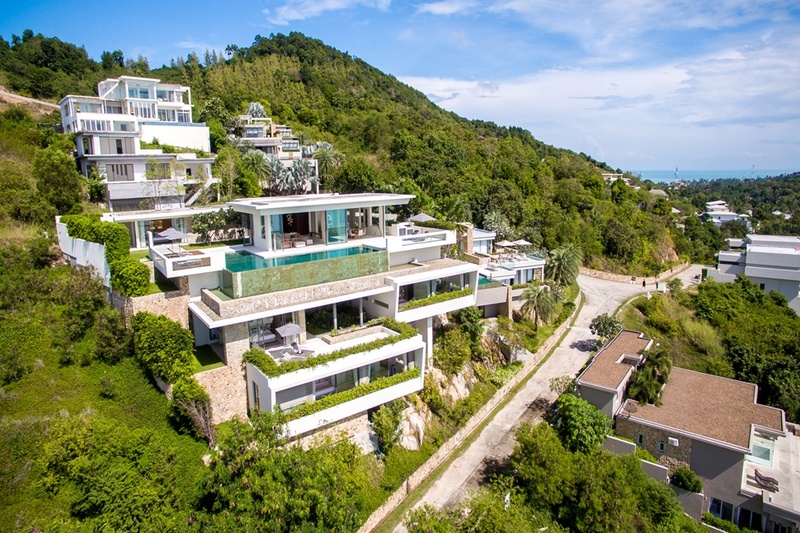 "A chic, contemporary private hillside villa"
Villa Natha is a chic, contemporary private hillside villa located a short distance from Koh Samui’s most popular shopping, dining and entertainment enclave that lines Chaweng beach. 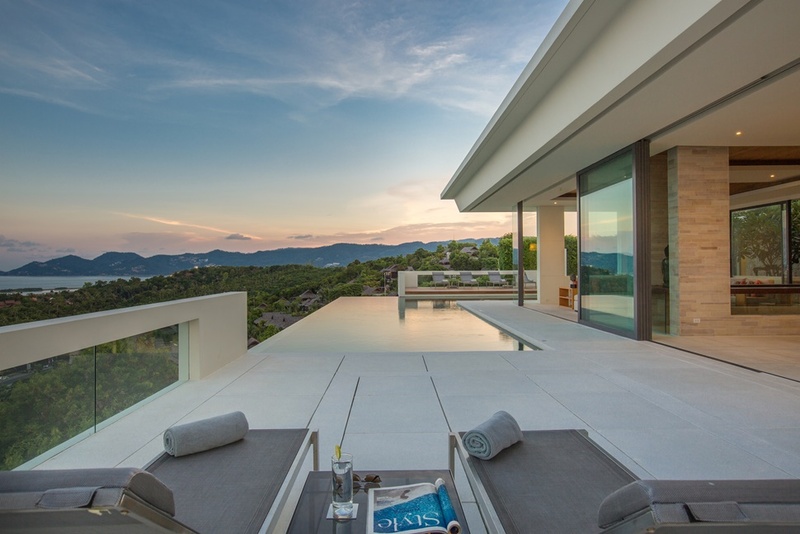 The villa offers guests the best in modern luxury with breathtaking 180 degree views of Koh Samui’s tropical coastline and out across the crystalline waters of the Gulf of Siam. 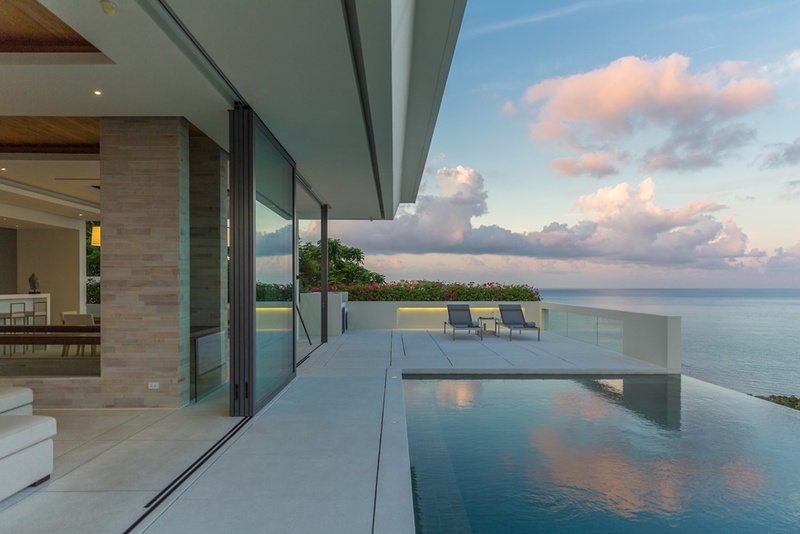 The villa’s stunning multi-level architecture provides a seamless combination of relaxed indoor and outdoor living, with wide terraces for lounging in tranquil comfort and a dramatic 15 metre L-shaped infinity pool that flows right into the soothing ocean vistas. 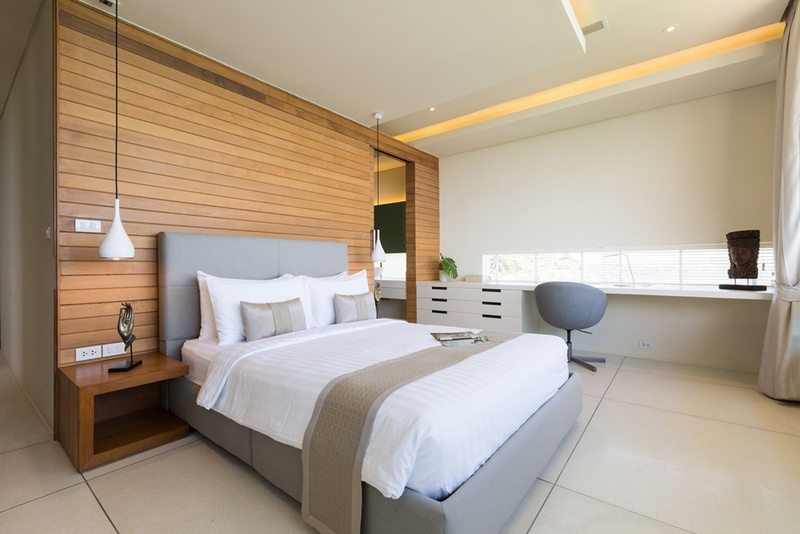 Inside the property, a cool combination of crisp white walls, smooth marble tiled floors and warm wooden finishing offers guests a truly upscale ambiance. 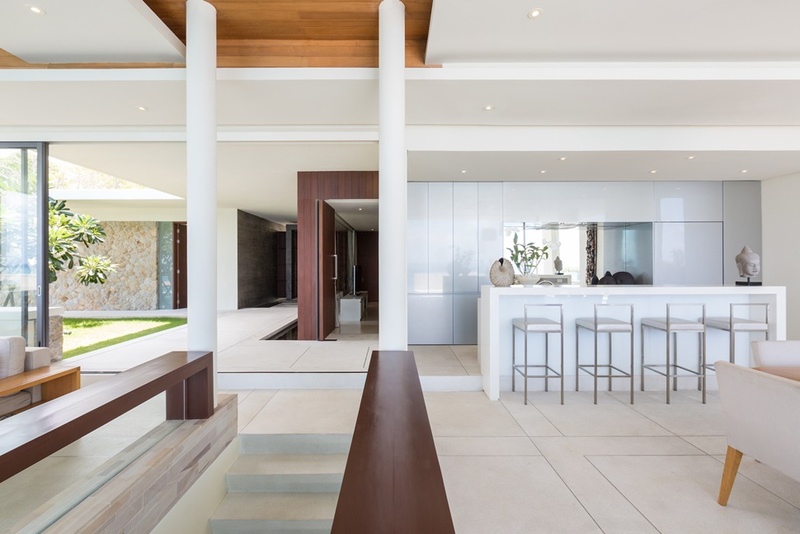 The sophisticated interior design blends natural textures and gentle Asian touches with an emphasis on providing the most convenient, comfortable island lifestyle possible. 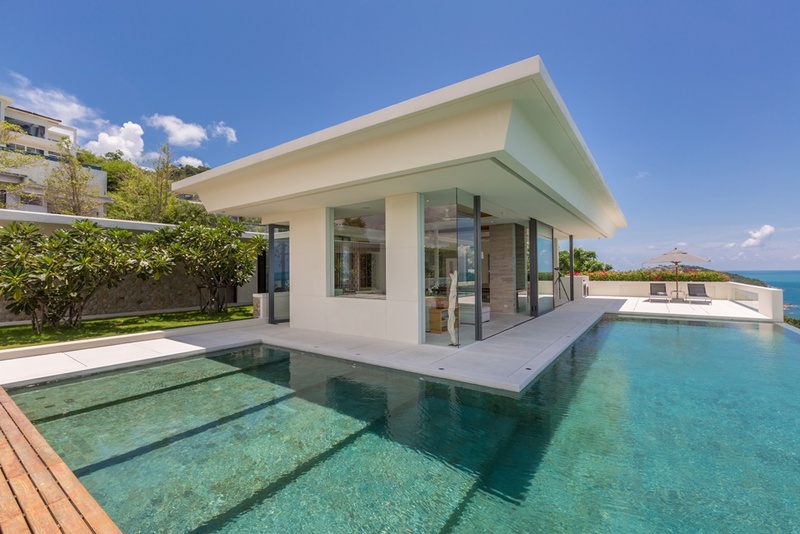 The villa’s capacious design includes generous open-plan living and dining spaces on the upper floor, both of which fold open onto the furnished poolside terrace. 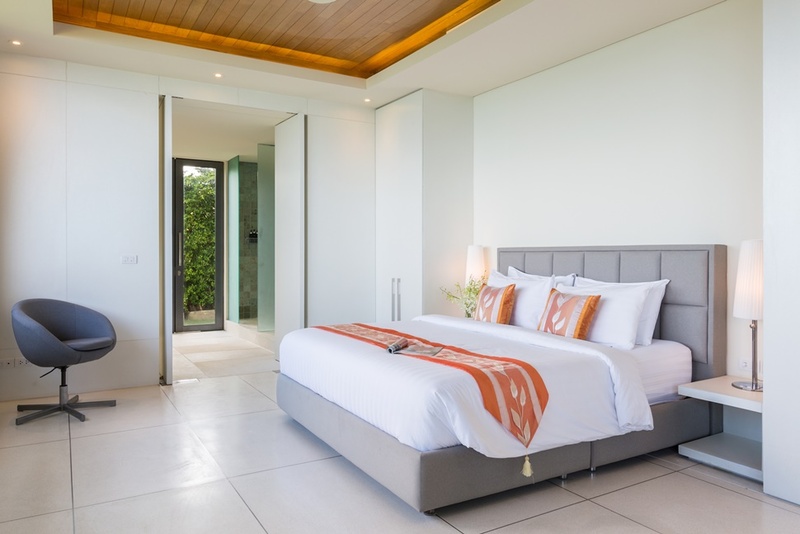 There is also a second, spacious furnished lounge area and the villa’s five luxurious bedrooms are spread over three floors, all of them featuring ensuite bathrooms, some with a choice of indulgent private bathing options. 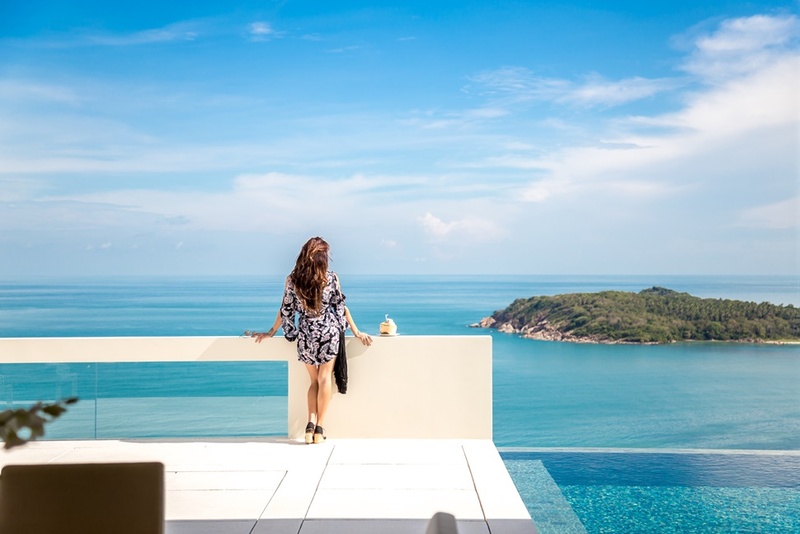 Guests that choose to stay at Villa Natha spend their vacation surrounded by contemporary luxury and style with top notch services and astounding island views that add a calming natural influence to enhance the overall pleasure of the stay. 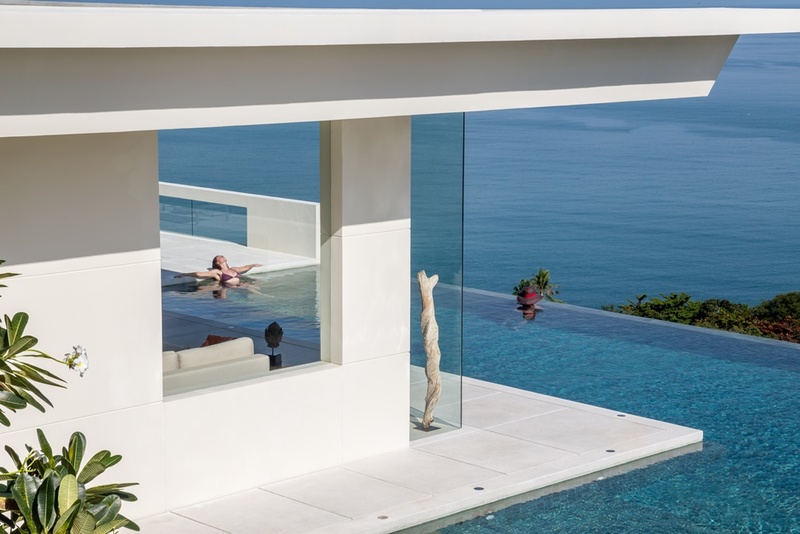 Villa Natha is cleverly constructed over 3 levels to maximize the usable space and superlative ocean views. 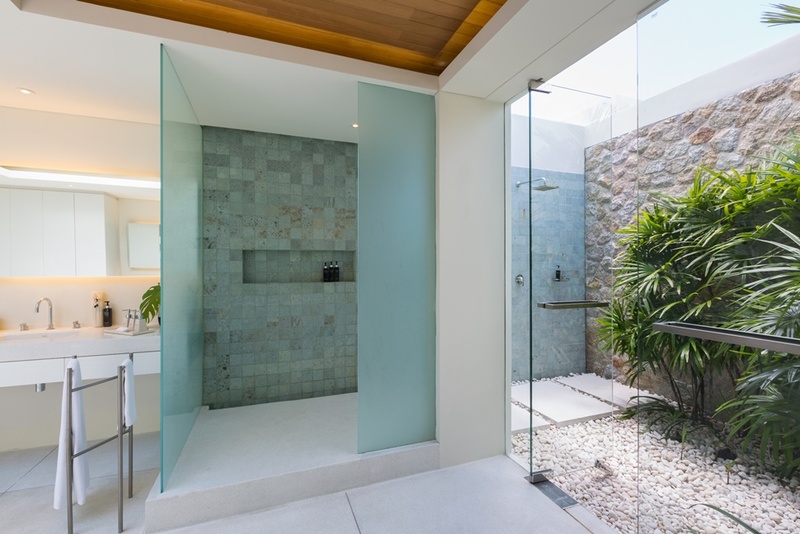 Each level boasts its own private garden area and is connected to the next floor by an enclosed inner stairway. 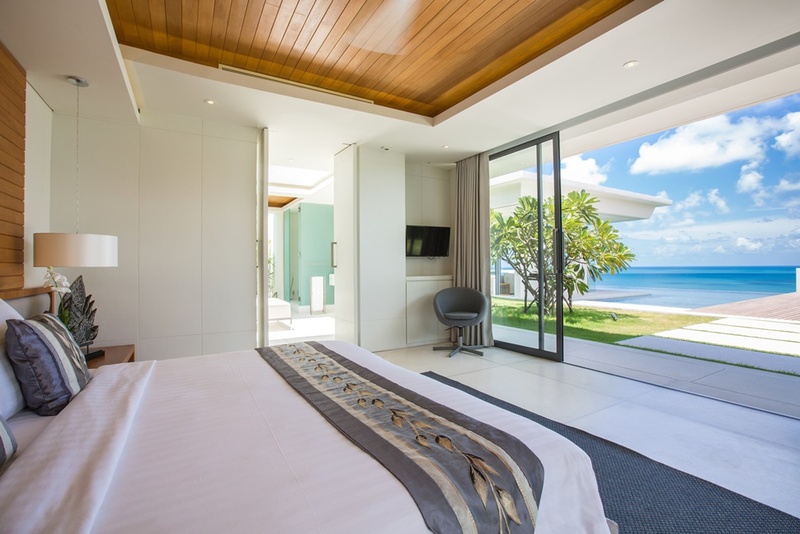 A spacious walk-through lounge, seaview dining room and fitted show kitchen are all situated on the upper floor, as is one of the 2 master bedrooms. 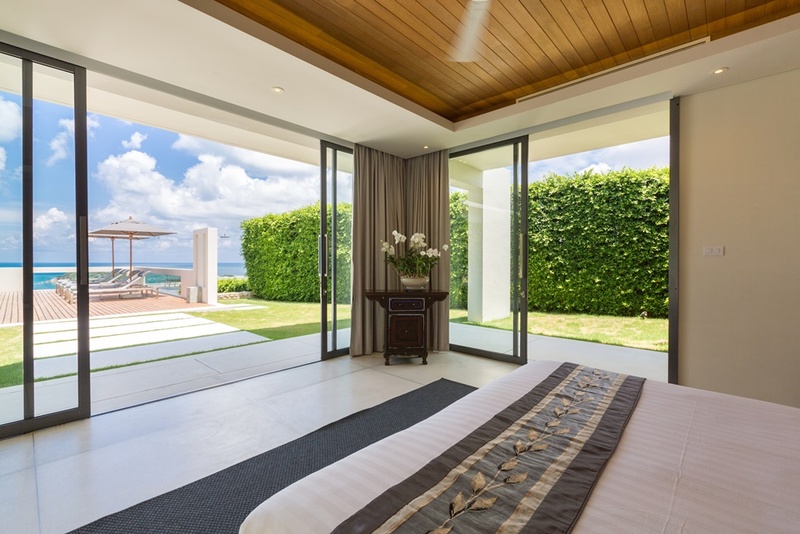 This bedroom and upper floor living area open directly onto the inviting infinity pool and its furnished stone and wooden sun terrace, while the dining room extends onto a separate terrace with a built-in barbecue unit for alfresco meals. 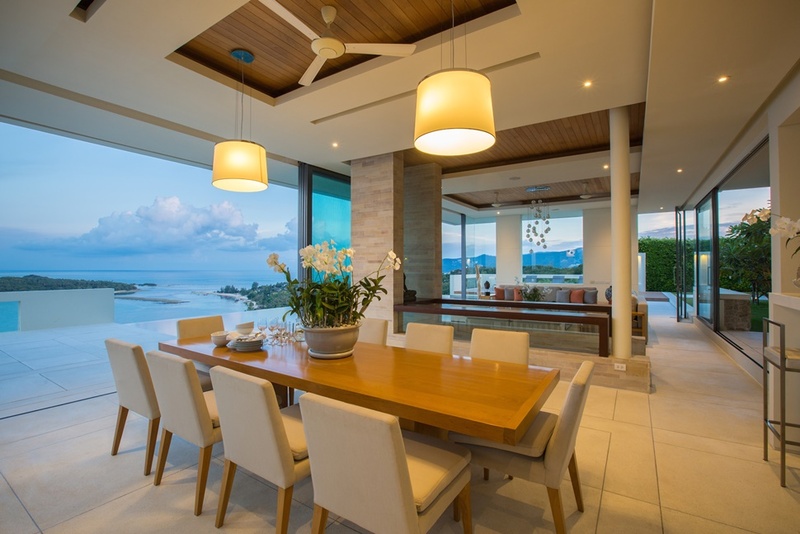 The villa’s comfortable upper level lounge is furnished with an inviting oversized double sofa suite, while the airy dining space easily seats 10 guests at a long polished wooden dining table. 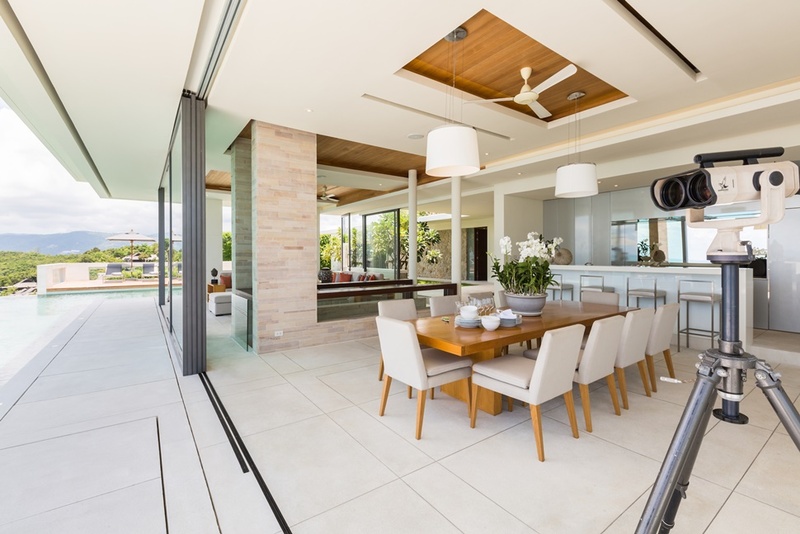 The dining room also features a breakfast bar and stools, and both areas are directly served by the villa’s fitted western style kitchen. 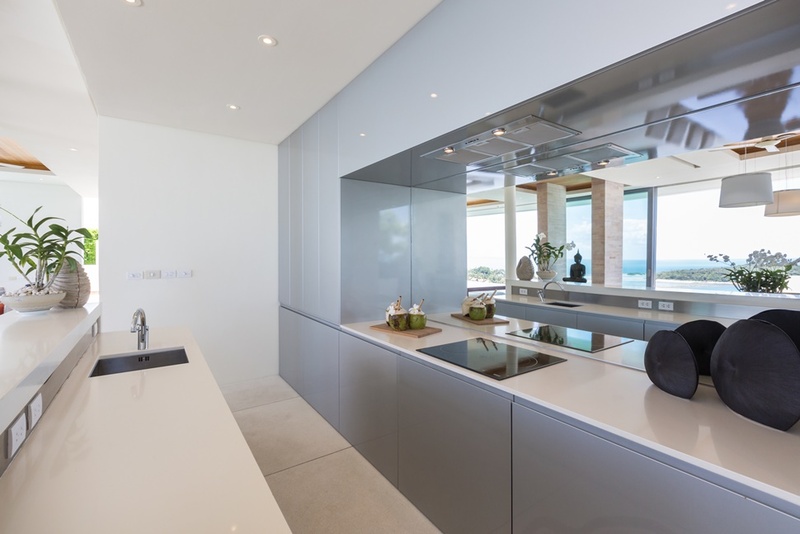 A second kitchen is primarily use by the private chef and staff team to prepare guests’ meals. 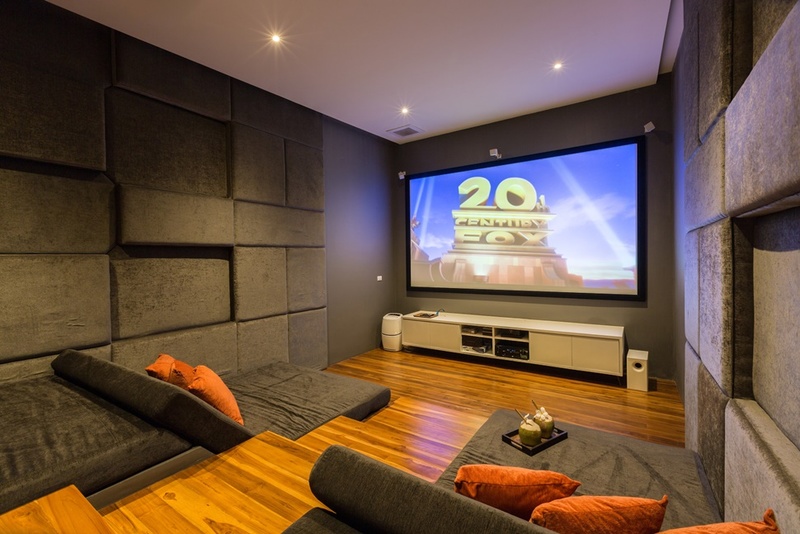 A second living area and media room is situated on the middle floor of the property, furnished with a long, ultra-comfortable sofa facing a large flat screen TV. Sliding doors at one end of the room open onto a study or private office space. 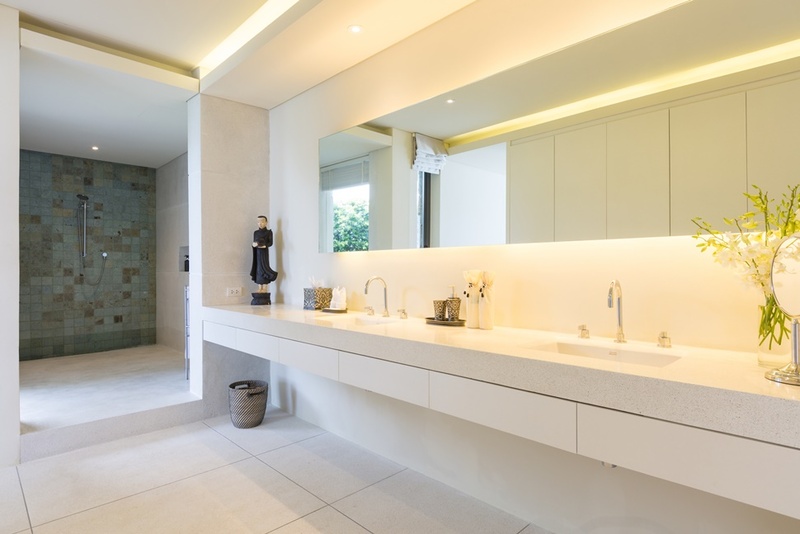 All the living areas are fully air-conditioned for guests that want to retreat for the tropical heat. 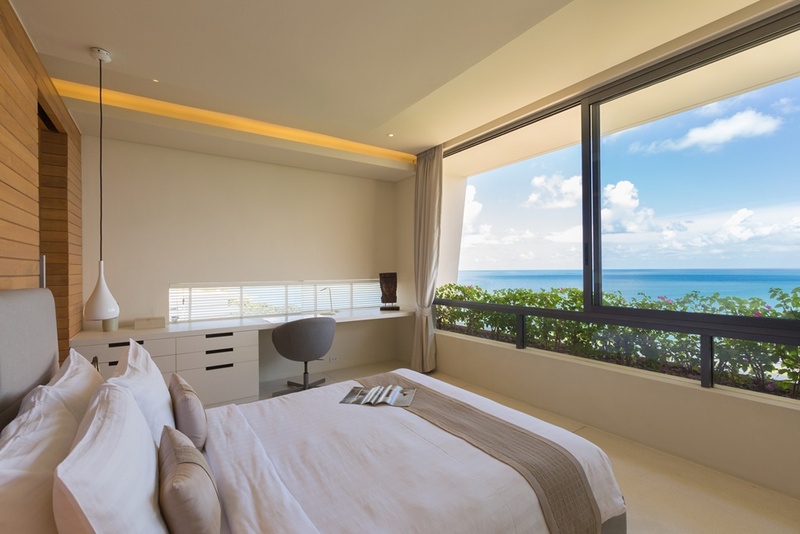 The villa provides guests with 5 double bedrooms (3 King and 2 Queen), all of them offering sensational sea views right from the bed. 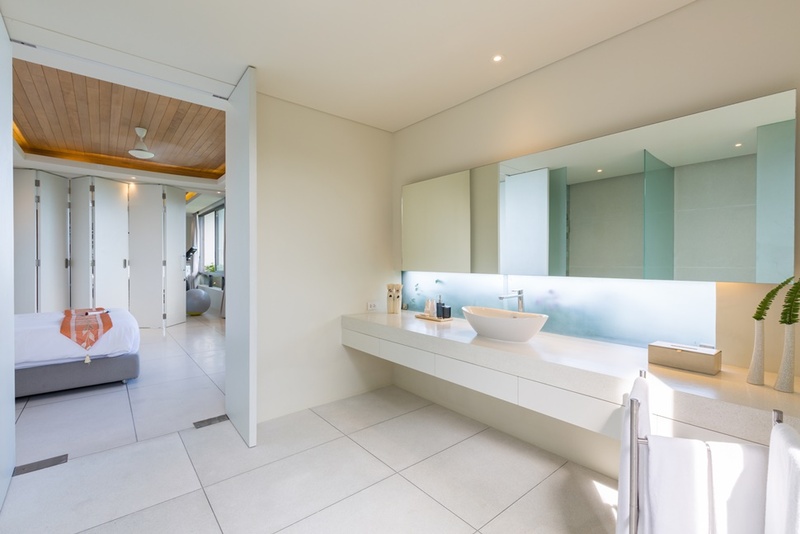 TVs and built-in wardrobes add to the feeling of a 5-star resort, while the huge en-suite bathrooms attached to the 2 master suites go one step further with twin wash basins and a choice of indoor or outdoor showers. 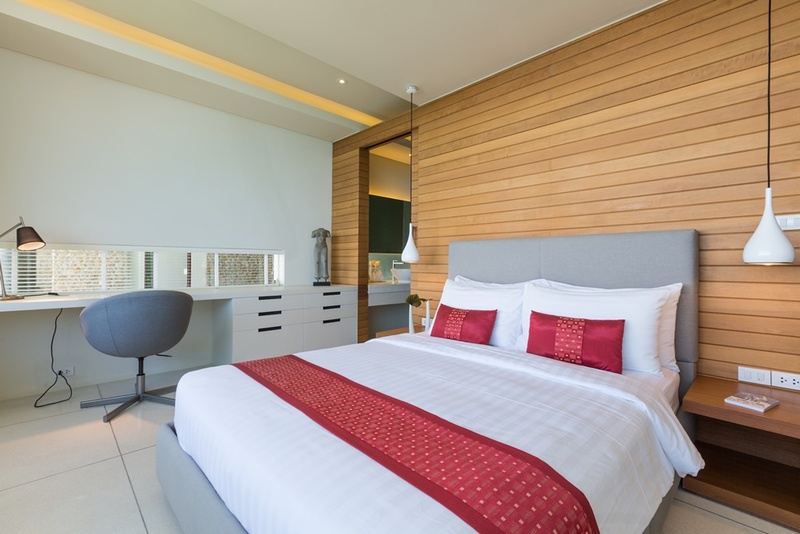 The remaining guest bedrooms, although slightly smaller, also offer comfortable, modern resort-style accommodation with a full range of private amenities. 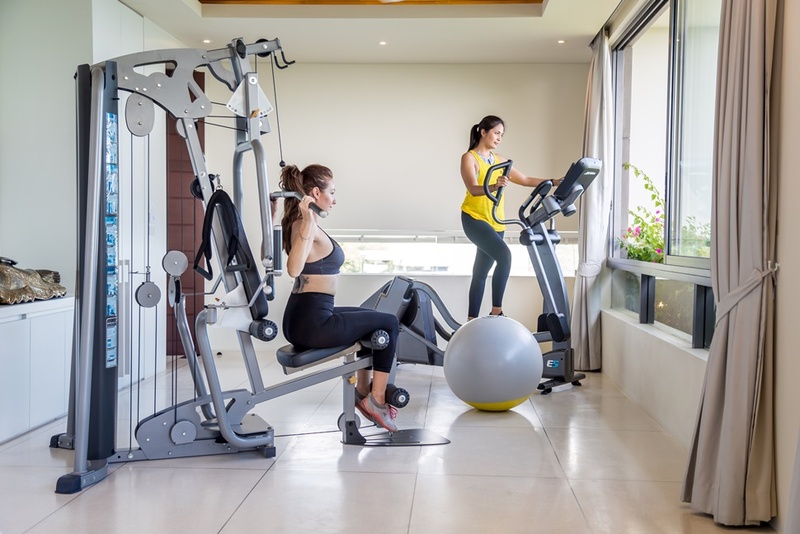 Additional exclusive facilities on offer to guests at Villa Natha include a fully equipped private gym, as well as a fabulous private cinema with comfortable seating, a large projector screen, surround sound system. 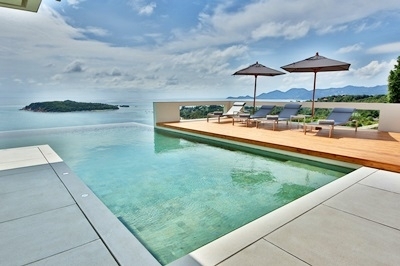 The property is fully protected by a 24-hour security service and comes with its own private parking spaces for guests. 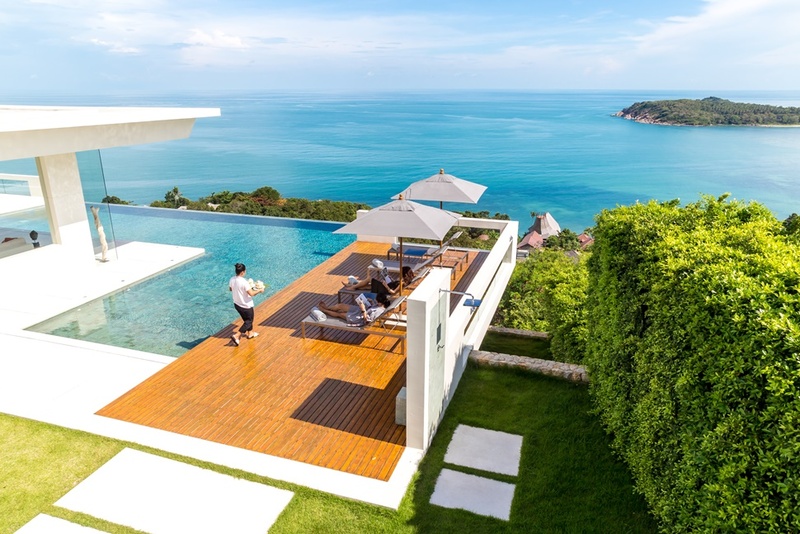 With a striking, contemporary tropical design and an exceptional east coast location, Villa Natha is a tempting option for families or groups of friends looking for a stylish, exclusive island escape located a short distance from Koh Samui’s main tourist amenities. 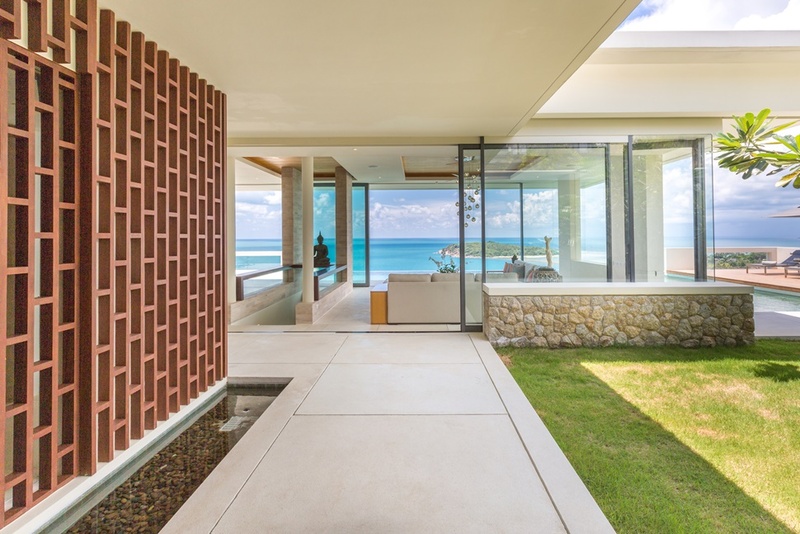 For those in search of total escape, the spacious living areas and clever combination of indoor and outdoor spaces mean guests also can enjoy tranquility, action, social and private time without ever leaving the villa. 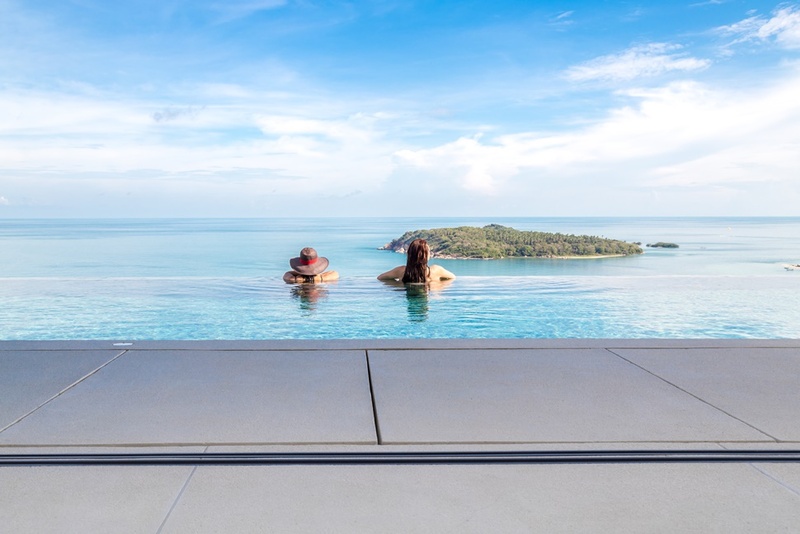 The oceanview infinity pool provides a stunning focus for daytime and evening indulgences, while the spacious terraces and built-in barbecue encourage guests to make the most of the island’s kind climate and tropical environment. 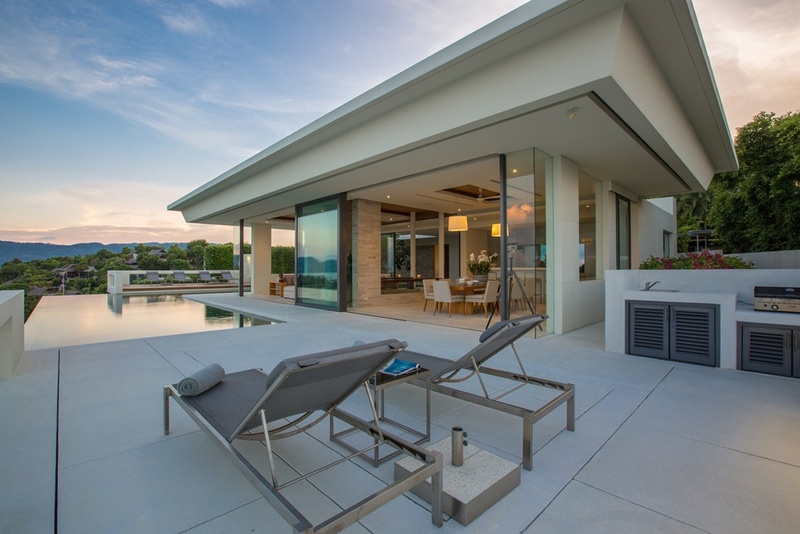 The wooden sundeck with designer loungers is ideal for lazy days in the sun, and the dining terrace offers the perfect spot for sundowners before retreating to the private cinema for a movie marathon. 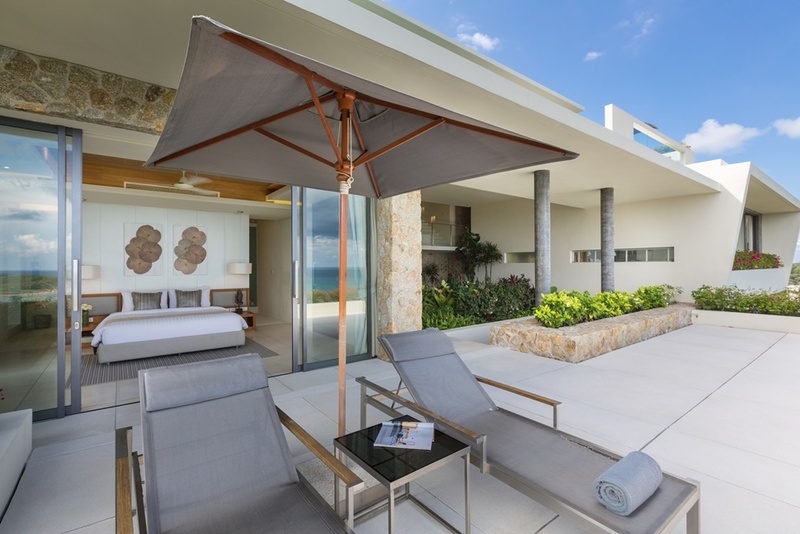 Although the villa is not on the beach, the dramatic ocean views and lush tropical surroundings guarantee an unforgettable, exclusive vacation. 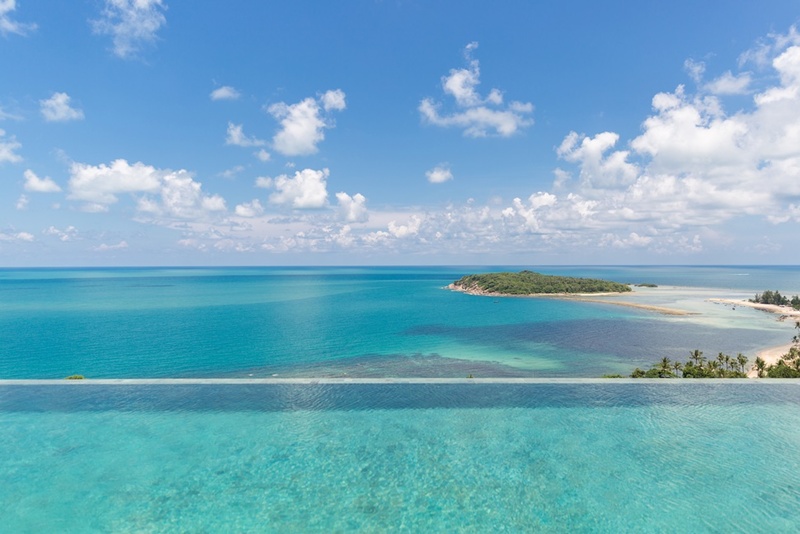 The impressive range of stylish, contemporary amenities perfectly complements the blissful natural surroundings, allowing guests to relax and enjoy the ultimate island lifestyle. 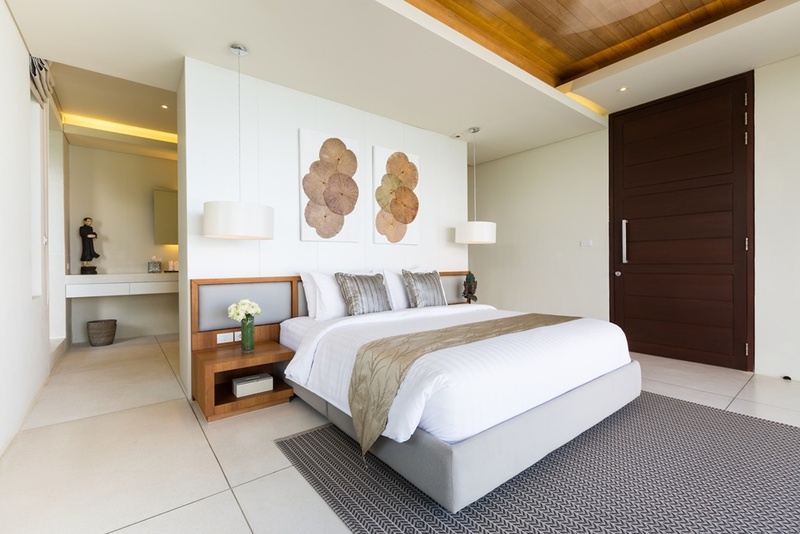 The villa manager and staff ensure that all guest requests are swiftly answered, and a housekeeping team also provides daily cleaning services to make sure the villa remains clean and tidy throughout the stay. 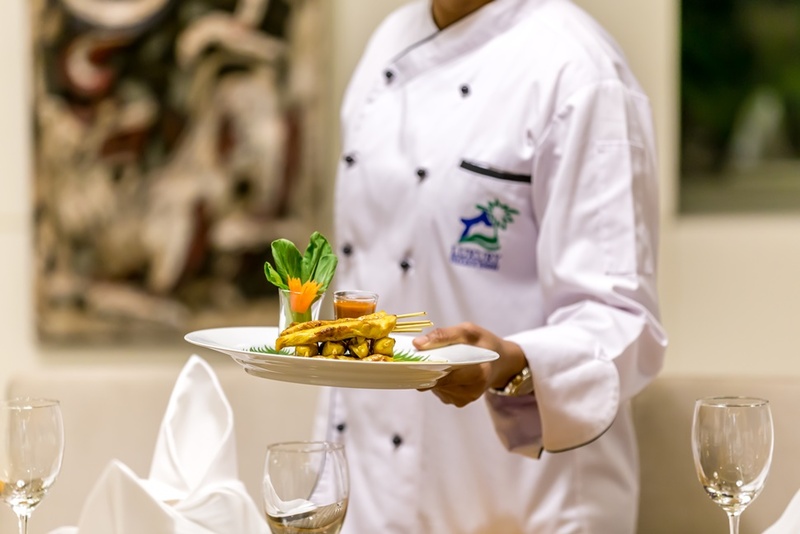 The villa’s private chef is on hand to prepare and served meals to guests preferred schedule, and delicious Thai and western cuisine can either be enjoyed under blue sky or stars on the terrace, or in the comfortable, elegant dining room. 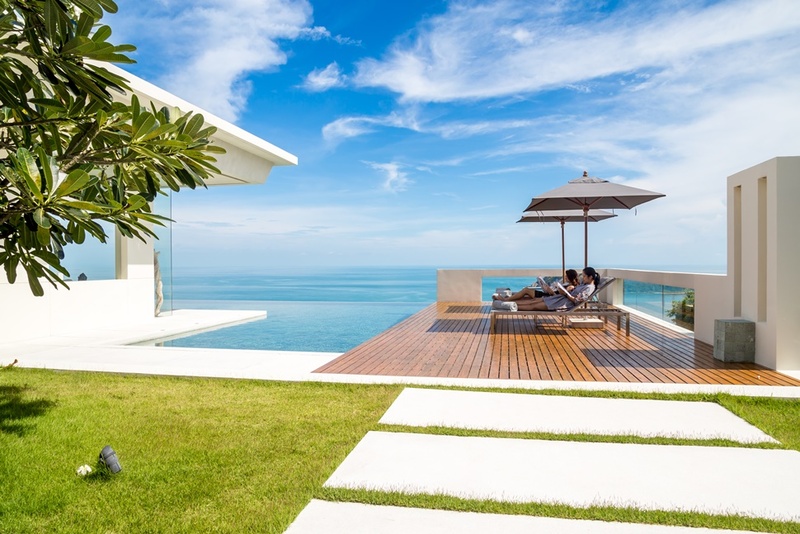 Villa Natha is located within the prestigious Narayan Heights estate, which sits on a forested east coast hillside that rolls gently down to an unspoilt stretch of beach. 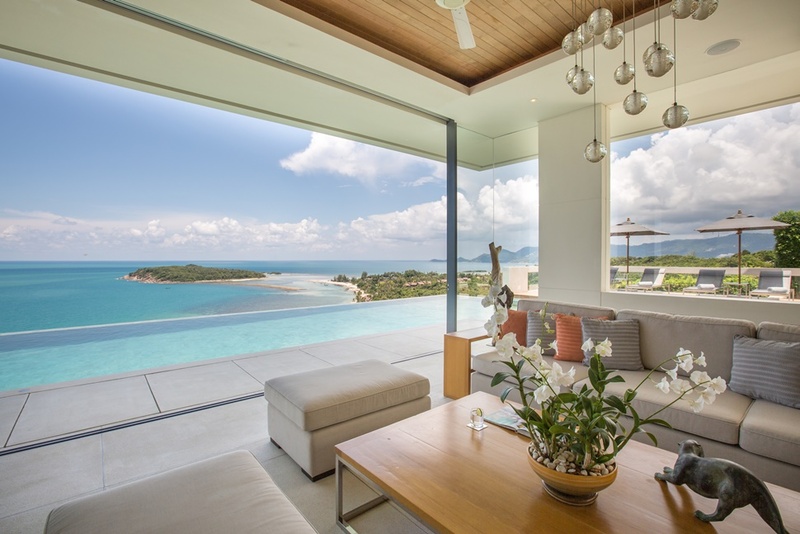 The villa is bathed in superlative ocean views and sea breezes. 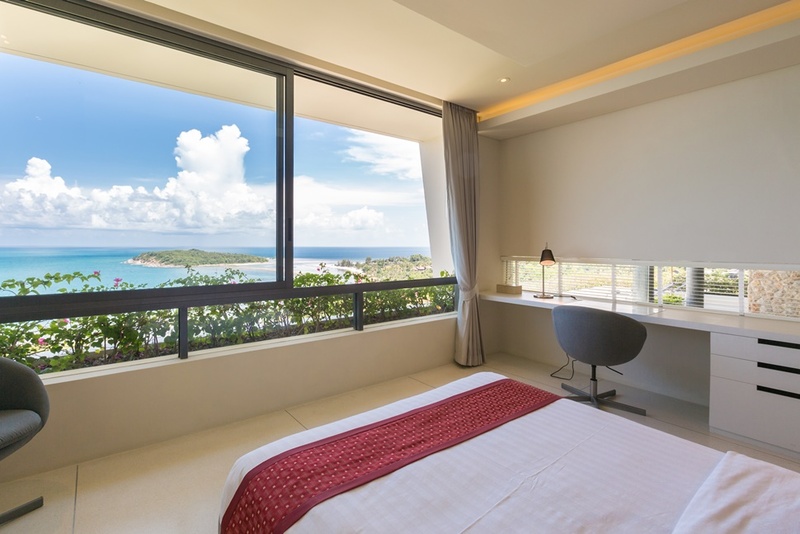 It is also conveniently situated just 10 minutes from the island's most popular beachside shopping, dining and entertainment strip at Chaweng. 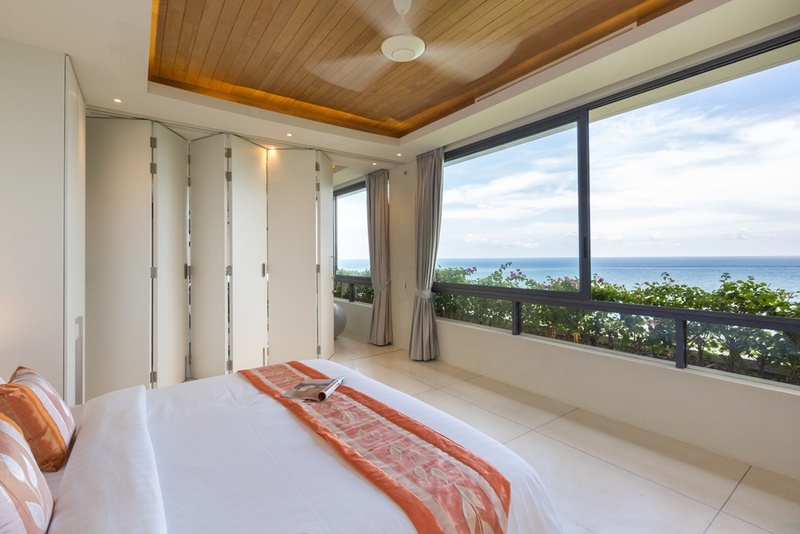 It is just 10 minutes’ drive from Samui International Airport. 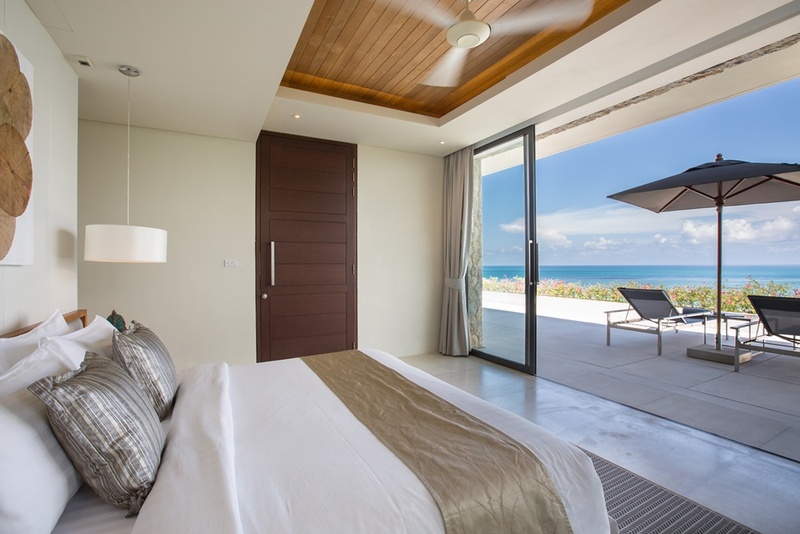 The resident villa staff will ensure the villa is kept clean and tidy. 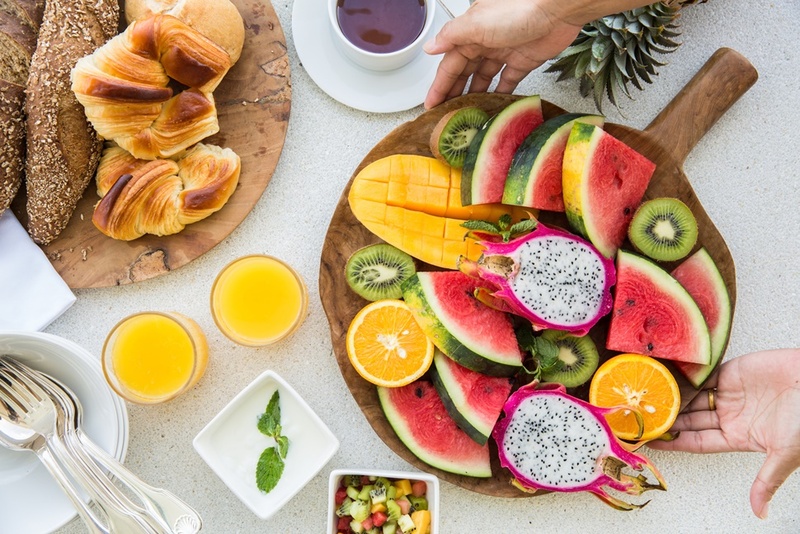 The Villa Manager is available to cater to guests' specific needs and can help organize island activities, massage and spa treatments, as well as dealing with any matter arising at the villa. Our Guest Relations & Concierge team will visit guests during their stay (usually the day after check in) to further ensure guests have a pleasant stay or to address any matters arising at the villa. 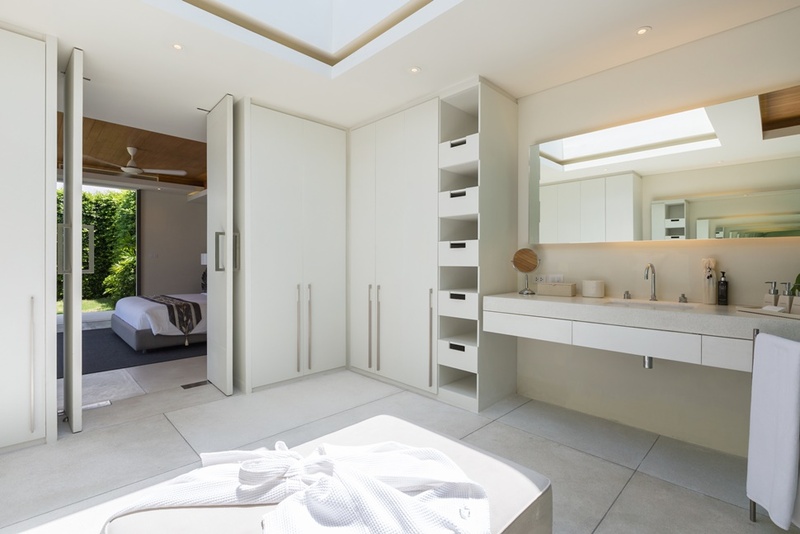 All basic laundry is done for guests on a complimentary basis. 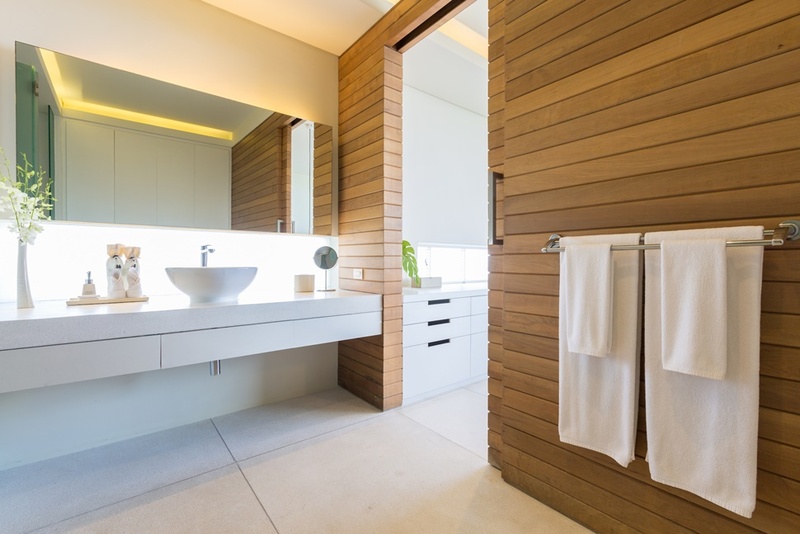 Bed linen is changed every third day and towels are changed as necessary. 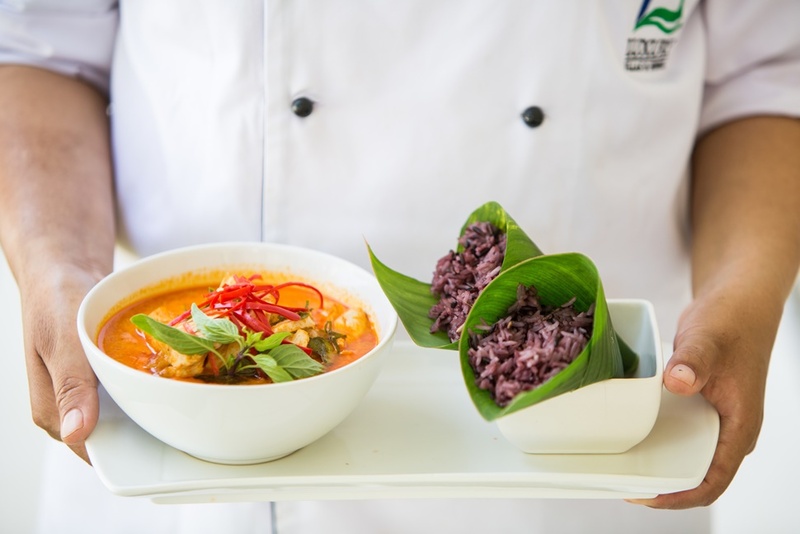 On site Thai Chef (Thai cuisine and Western favourites) with shopping list available. Food cost on Guests’ account (Terms & Conditions may apply for chef service).